to further the cause of justice. rest if you so wish. inherted the good points from version 1, the fighting action and variety of weapon bring this game to be more famous, and can be compare to the street-of-rage even with an elder age. As the rare of 2 players game that time, this game was been a big market. For newer gamers, they may not like this game, as the graphics there is not very good, the control there is not easy to handle, only a limited physical skill you can use with the character, and the skill use to hit the boss is so repetitive (like shooter:( ). 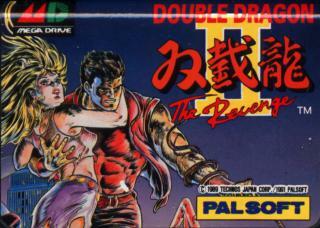 Some how, this game and it's style sure be the father of all newer "beat-&-up" (final fight or SOR). The story is about the safe main characters girl friend from bad people (how general story is!:)). If both the main characters clear the game, the main character need to fight each other for their own ending. God help us all! A tacky conversion of an ancient game is not a recipe for success. 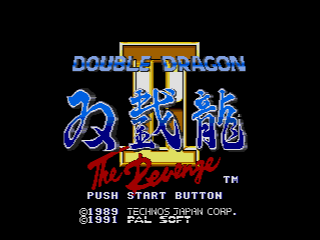 One of the worst Mega Drive carts of all time. You have been warned. 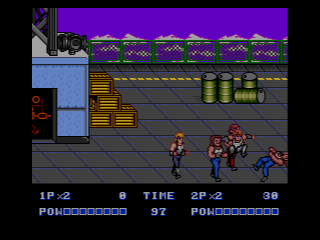 Any Streets of Rage game is 10 times better than Double Dragon 1,2 or 3! 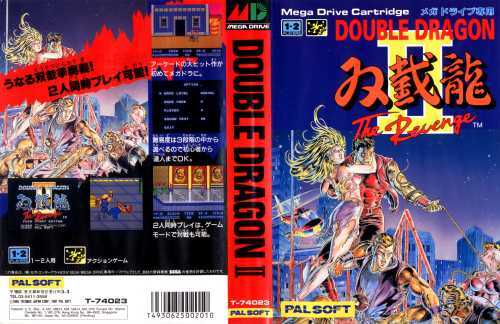 I think this game aged pretty badly; I picked it up a few months ago because I had some good memories of the pc version, but it's actually a very boring game compared to the likes of Streets of Rage II.